2425 Flora Ave Fort Myers, FL. | MLS# 218071844 | Southwest Florida Residential Real Estate for Sale. HUGE PRICE REDUCTION!! Must See! This home is so deceiving! It is so Charming yet so Spacious too! This beautifully landscaped home has fabulous Mature trees with touches of palm trees including Royal Palms amongst this HUGE lot. Lot to left of the home (see pictures) has been recently strapped together with home to sell as one unit, therefore making this home and Xtra lot very desirable & unique to the area! Centrally located in highly sought after Ft Myers Villas, close to shopping, dining, entertainment & more. 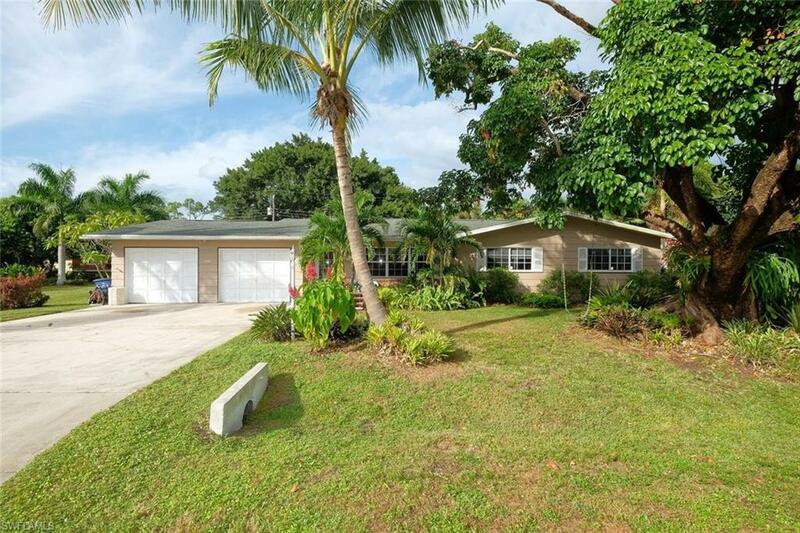 This POOL home has 4 bedrooms & 3 full baths w/2 car garages and an xtra garage on side of home for golf cart, motorcycle or use as workroom w/electric. Home has formal living room as well as large great room with Fireplace. Tile and wood floors throughout all rooms. Kitchen has raised panel cabinetry with nice appliance package including new dishwasher. One bedroom has built-in office space as seen in pictures. Pool area has large screened lanai w/ baby gate for safety. Another plus-home has city water and sewer. A/C approx. 5 yrs new. Other great features include: Updated windows, Alarm system, Hurricane Panels, additional concrete pad, pool bath & more. Call today! !